Ruth Binney (neé Chanter) spent her childhood in Tiverton where her father was a housemaster at Blundell’s School. For 10 years between 2002 and 2012 she lived in West Stafford, a village just outside Dorchester with her late husband Donald, where she continued her writing and editorial consultancy as well as her interests in gardening (as General and Show Secretary of the Bockhampton and District Horticultural Association and in her own garden and allotment) in cooking and entertaining and in walking and caring for the countryside. Ruth was educated at The Maynard School Exeter and Tiverton Grammar School from where she gained an Exhibition in 1962 to Girton College Cambridge to read Natural Sciences, studying Botany, Zoology and Physiology in Part 1 and Genetics in Part 2. She also won a swimming half blue. Her career in illustrated non-fiction publishing began at Thames and Hudson on The Explosion of Science. Ruth is now happily settled in Yeovil, Somerset and working on a variety of projects. Her Animal Lore and Legend, sequel to the successful Plant Lore and Legend (2106) was published in November 2017. She currently researching and writing a book about numbers (everything from lucky 7 to Chanel No.5) as well as enjoying the luxury of ‘retirement’ including family and friends, travel and football. Editor at Mitchell Beazley, including the natural history and medicine volumes of The Joy of Knowledge Encyclopedia. Editor at Marshall Cavendish partworks, including The Book of Life, Nice ‘n’ Easy and Doctor’s Answers. Editorial Director at Marshall Editions, book packagers – responsible for a wide range of successful titles, ranging from The BUPA Manual of Fitness and Well-Being to Great Battlefields of the World, The Manager’s Handbook, Structures and Strange Worlds, Amazing Places. Development Editor at Reader’s Digest – responsible for generating ideas and close involvement in the testing and marketing processes. A key member of the senior management team. Involvement with the production and quality of titles, specialising in cookery, gardening, natural history, medicine and health, computer and puzzle titles. The Mitchell Beazley pocket books: Wild Flowers Garden Plants. The Mitchell Beazley/RHS gardening series. Contributions on regional folklore to new editions of the AA Yellow Guides. Article on country houses for Discover Britain magazine. Contributor and originator of the concept for Birds: Myth Lore and Legend (Bloomsbury, 2016). Editorial adviser to Pearl’s Diary, 1906-1930, The life and times of Pearl, Lady Montagu of Beaulieu (2017). 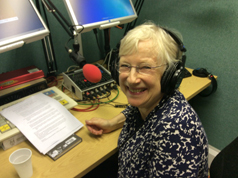 Ruth is regularly interviewed on BBC local radio and has appeared on Radio 4’s Open Country. In 2015 she has appeared twice on the Radio4 ‘PM’ programme, talking about the weather. Her prediction in May for a ‘mixed bag’, based on the progress of oak and ash trees turned out to be more accurate than those of the scientific broadcasters. She regularly conducts books signing and gives talks to local associations on her Wise Words books, particularly gardening, cooking and the weather, and on her publishing career.